When the 3-day AXPONA, aka Audio Expo North America, opens this Friday, April 12, in Chicago’s spacious Renaissance Schaumburg Hotel & Convention Center, the team of Editor-in-Chief Jim Austin, Technical Editor John Atkinson, Senior Contributing Editor Herb Reichert, and a lowly Contributing Editor with the initials JVS will be posting reports throughout the day and eve on many of the most exciting and noteworthy displays in the show’s 197 active exhibit rooms. 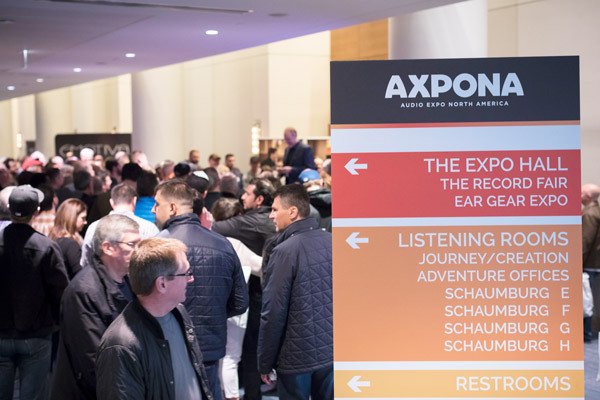 AXPONA’s record number of active exhibits—up from 183 in 2018 and 163 in 2017—will be augmented by 49 exhibitors in 54 booths in the huge Expo Hall and 36 exhibitors in 58 booth spaces in the Ear Gear Expo. More than 50 of those exhibitors and brands are first-timers. There are so many exhibitors that AXPONA put a listening room in the Expo Hall for a Raidho / Pear Audio / Jadis system, which includes the premiere of the Raidho TD1.2 speakers. That’s but one of dozens of expected premieres at a show that some are calling, with just a bit of hyperbolic spice, the Munich High-End of North America. Premieres listed on the show website include—counting only speakers—Ancora, Acoustique Quality, Audioengine, Bayz Audio, Bending Wave USA, Credo Audio Switzerland, Goldmund, KLH Audio, Magico, Raven Audio, Salk Sound, Sonner Audio, SVS, T+A Electroakustik, Voxativ, and Wharfedale (via Mobile Fidelity). Other categories include such goodies as the D’Agostino Momentum HD preamplifier, EgglestonWorks Nico Evo loudspeakers, an E.A.T. turntable—and not all the premieres are listed on the website. Attendees and your intrepid Stereophile team will be able to locate everything easily via a new downloadable mobile app that includes a complete show schedule, floor maps, and exhibitor guide. Pre-registration is up significantly from last year and remains available until the show opens on Friday at 10 AM. Before anyone laments the imminent death of the high-end, they’d be wise to take a look at this show and the thousands of eager audiophiles who will visit each day. One of the many reasons AXPONA draws the biggest crowds of any US show is that on-site parking is free. Another reason is two nights of free concerts, including Grammy Best New Artist (of 20 years ago) Shelby Lynne of “A Little Bit of Luvin’” fame and “brilliantly nuanced” vocalist/guitarist Seth Walker plus Chicago’s Ander/Church Duo on Friday. Most of the panels and seminars will be new for 2019—although our own Michael Fremer is repeating his “Internationally Renowned Turntable Set-Up Seminar.” He’s also participating in the panel, “Sound Investment: What We Know About the High-End Vinyl Market,” on Friday at 12:30. If it’s Herb Reichert you’re after, don’t miss “Expanding Your Music Appreciation: Critical Listening,” the panel he’ll be moderating Saturday at 3:00. Technical Editor (and former Editor-in-Chief) John Atkinson moderates a discussion about loudspeaker design and testing with Paul Barton of PSB on Friday at noon. Not to be outdone, occasional contributor Steve Guttenberg converses with ELAC’s Andrew Jones on Saturday at 11:30 AM. Another panel of great import, “Finding the Next Generation of HiFi Listeners,” takes place on Friday at 3:00. Although the unquestionably hip moderators are well-informed retirees, they will engage in a cross-generational exploration with four relatively young members of our industry. Check back frequently on Friday, Saturday, and Sunday for reports on premieres, fabulous sounding rooms, and lots more.